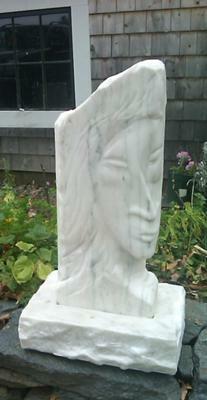 I have been doing stonework for thirty years, and have been sculpting stones as a hobby for the past ten. I have always given my carvings away to friends and family. I had my first exhibit last fall, very exciting. I have recently been commissioned to do a carving of two seals sunning themselves on a natural rock. The clients let me choose the theme, based on a favorite stuffed animal of their grandson. The mom will be of nh gray granite, and the baby will be of a much darker stone. I am inspired by Rodin, Modigliani, and life. Carving stone helps me through stressful times.